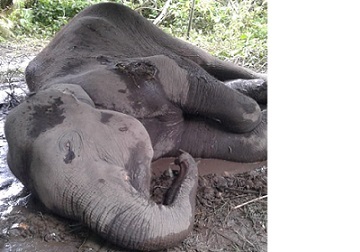 In a tragic incident, a wild jumbo is battling for life since the past few days at Borongabari village near Santipur along the Indo-Bhutan border in Udalguri district. The wild elephant, a makhana (male elephant without tusks) about 18 years old and 7 ft height, was witnessed in the bamboo forest on the backyard of one Dhireswar Deka, by the villagerson Wednesday. After being informed, the forest officials immediately responded and the district veterinary doctors led by Dr Surlov Sarma reached the spot to treat the jumbo. The site of the incident under Nonai Forest Reserve forest along the Indo-Bhutan border is an elephant corridor, about 30 km from the district headquarters, Udalguri. “Locals have provided food and water to the injured animal,” informed the forest officials. While talking to Northeast Now, wildlife activist Nabajyoti Baruah lamented for lack of centres like Centre for Wildlife Rehabilitation and Conservation (CWRC), the wildlife rescue, care and rehabilitation facility run by IFAW-WTI and the Assam Forest Department, comprising expert wildlife surgeons for rescue and rehabilitation of wild animals, which are mostly engaged in national parks like Kaziranga or Manas. “The wild animals in forests of Udalguri and Goalpara among others should be given equal priority like the animals of the national parks and wildlife sanctuaries by the Forest Department,” said Baruah. The local veterinary doctors suspect that the jumbo has internal injury pertaining to which it stopped taking food and went in dehydration state. The forest officials also suspect that the wild jumbo might have sustained injuries during a fight with another male elephant in the nearby jungles.